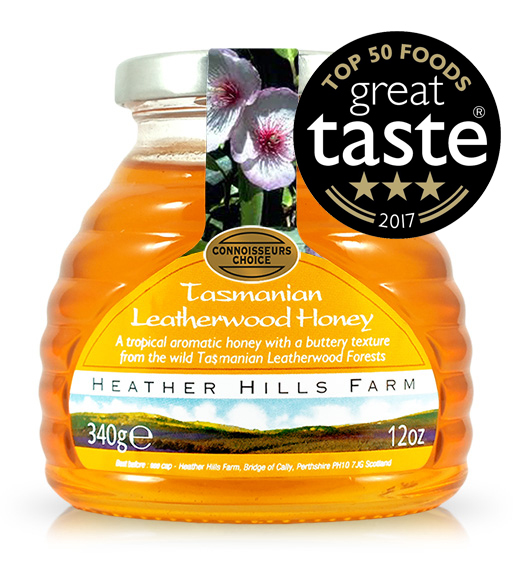 One of the finest and rarest honeys in the world, Tasmanian Leatherwood Honey has been prized by gourmets and connoisseurs for over 150 years for its unusual flavour and complex lingering palate. With a very unique aroma unlike other varietals, this is a varietal with character, considered by honey connoisseurs to be the best. Sourced from the nectar of the Leatherwood tree that only grows in the ancient rainforests of Tasmania, one of the most unpolluted places in the world, this honey is neither too sweet, nor too acidic - it's just right! It has an unbeatable floral aroma with a clean, fresh palate and a smooth, creamy, buttery texture that melts in the mouth. It has a long, full bodied finish with notes of wood and spice. Ideally pair this with a strong, blue cheese such as Roquefort or Bleu d'Auvergne or meats such as pork, duck, rabbit or lamb. Particularly heaven drizzled over bacon or cured meats and perfect when baking includes cinnamon, ginger and chocolate. This is the Earl Grey of honeys - one not to be missed!